The secrets of Zenith: unlocked. 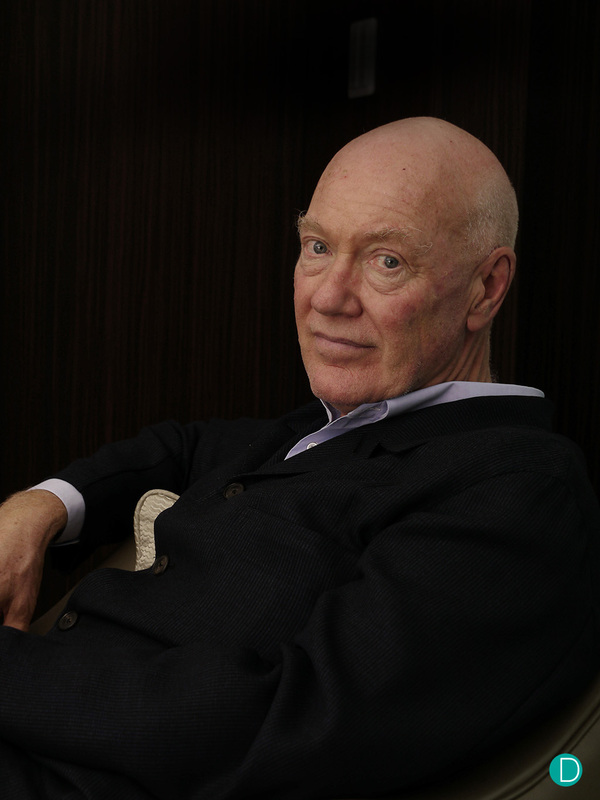 Jean-Claude Biver is an icon of the industry. A marketing genius, if there ever was one. Credited with the revival of Blancpain, Omega, and the immense success of Hublot, and now at the helm of TAG Heuer as well as Zenith. We caught up with him in Tokyo recently when we attended the launch of the Zenith El Primero Defy Lab, and discussed many interesting things about the business of horology, the technology and the market in general. 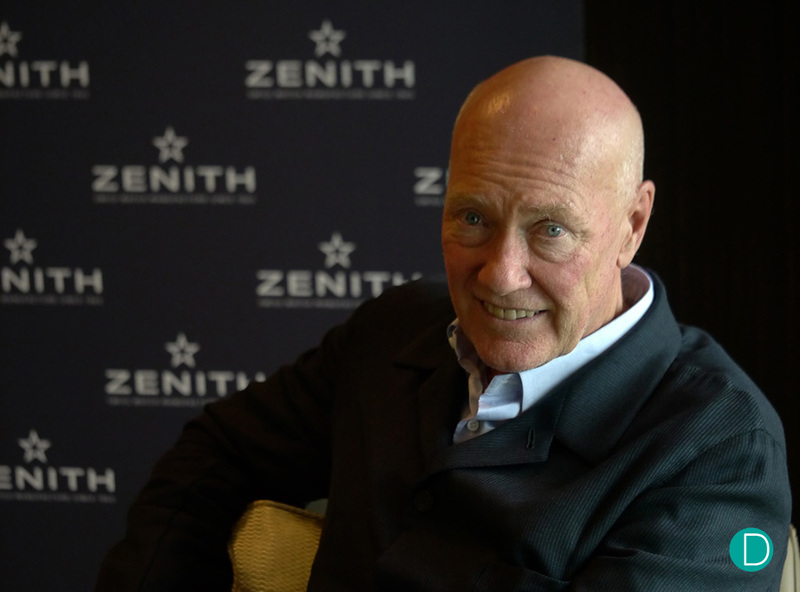 Jean-Claude Biver was his usual self when we met that afternoon just after lunch at the Palace Hotel in Tokyo. He was effervescent, energetic, and spirited. Jean-Claude has always been the “fire and brimstone” kind of communicator – with effective use of body language, facial expressions and gesticulations, he was always to always able to deliver a convincing and powerful message. And a joy to talk to. As a biographical retrospect, Jean-Claude began his career in the world of horology in Audemars Piguet and Omega. In 1981, together with his friend Jacques Piguet (who ran the movement manufacture F. Piguet, which by then was a dying concern), he bought the rights to the Blancpain brand name and rescued it from the doldrums in the depths of the quartz crisis. By then, Blancpain was defunct, but from these ashes, Jean-Claude built an effective marketing campaign and utilizing the movements by F. Piguet and into a respected haute horogerie house. In 1992, he sold Blancpain to SMH (now Swatch Group) and remained as CEO till 2003. I first met him at the Blancpain booth in Baselworld in 1999. With the sale, he joined the Swatch board and was put in charge of turning around Omega, which he did with clever marketing. He made changes in the product and marketing fields, employing techniques which he continue to use later in his career. One of these was the use of watches in product placement in movies, notably in James Bond films and celebrity sponsorships (including testimonials from Cindy Crawford, Michael Schumacher, and Pierce Brosnan). Jean-Claude left Omega in 2003, having presided over the company’s impressive recovery where sales had almost tripled over his 10 year tenure. 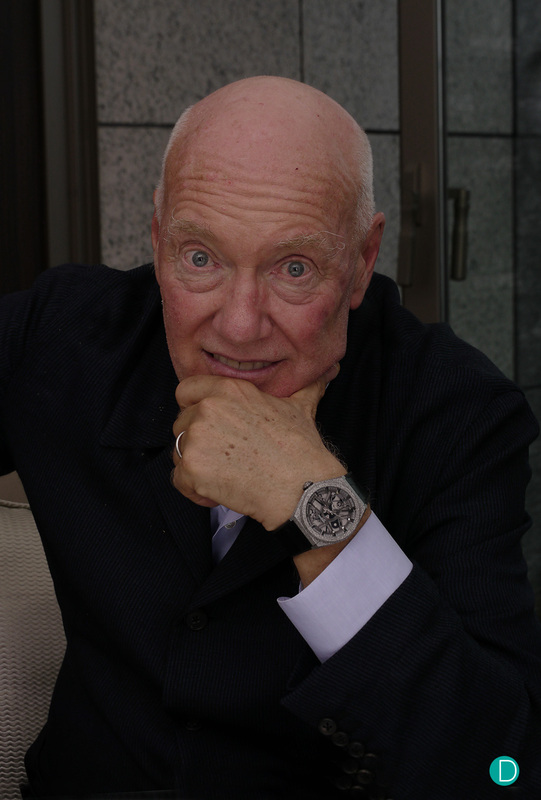 Jean-Claude Biver, photographed in Tokyo, September 2017. After leaving the Swatch Group, he contemplated a partnership with Franck Muller, but the legal hurdles were insurmountable. In 2004, he joined Hublot as CEO and Board Member. The battle cry of “Fusion” was invented, a mix of tradition and the future to drive the then sleeper brand forward. Jean-Claude was tireless and relentless in his passion to promote Hublot and Fusion. 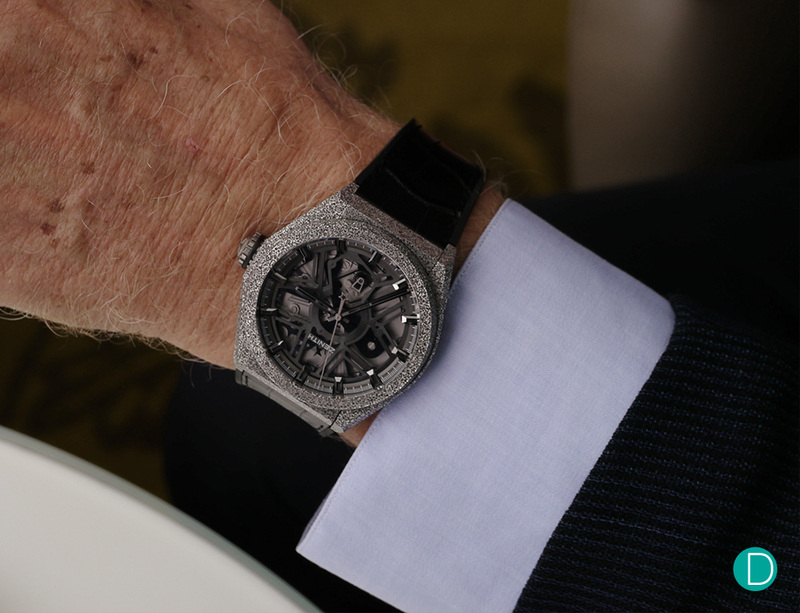 He used many of the techniques he had earlier honed during his tenure in Omega, and signed on huge mega-stars to wear, promote and talk about Hublot watches. Sales increased 500% from 2004 to 2007, and the company was bought by LVMH in 2008 for a princely sum. He continued to run Hublot after the purchase, super charging the brand, now with increased capital injection from the luxury giant. He has recently been taking a more oversight role within Hublot, having groomed and handed the reigns over to the next generation CEO – Ricardo Guadalupe. Jean-Claude was also put in charge of all the LVMH watchmaking brands (excluding Bulgari) – which meant that both TAG Heuer and Zenith came under his domain. He took over as CEO of TAG Heuer in 2014 and launched the title sponsorship of the TAG Heuer – MacLaren F1 team. He also briefly took over as CEO of Zenith after unceremoniously dismissing Aldo Magana in 2006, and in April 2017 he appointed Julien Tornare as CEO of Zenith. Thus the sleeping beauty awakens, as the combined firepower and passion of both Jean-Claude and Julien work to power it forward. In Tokyo, Jean-Claude was presiding over the launch of the Zenith El Primero Defy Lab for Asia. As we met, I asked if Julien will join, he remarked, “we need to maximise our time. When I am in a certain place, Julien will not be there. Where he goes, I don’t need to follow. We are not on holiday. We are here to work and promote the brand. Only one of us present is enough.” Powerful words indeed, and spells out perhaps his work ethic. And impressive. 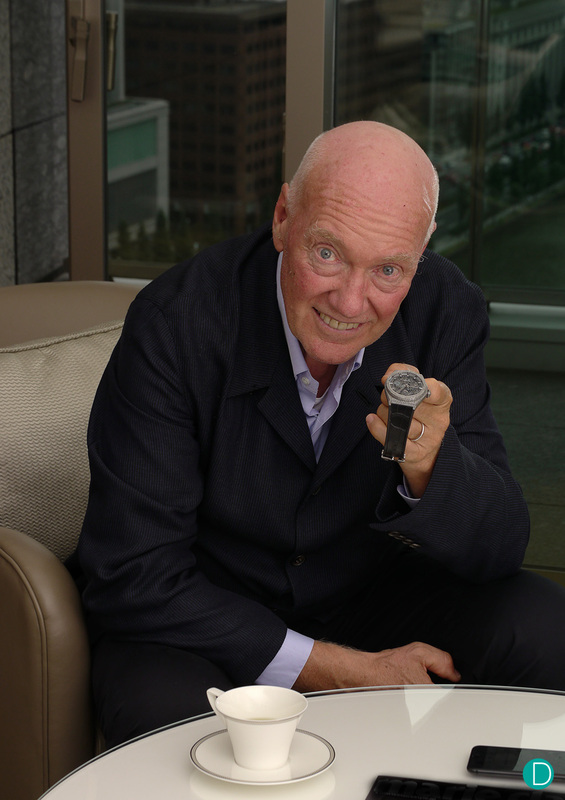 Jean-Claude Biver, with the new Zenith El Primero Defy Lab. Photographed in Tokyo, September 2017. Early information unveiled by Julien Tornare in our conversation with him. First photographs as embargo breaks for the Defy Lab. Full hands on review of the Defy Lab. As the next step forward, Jean-Claude shared his new blueprint for Zenith. A new way to engage customers. How? Portrait of a genius. Jean-Claude Biver. September 2017, Tokyo, Japan. The engagement model for Zenith will have to change. He is implementing more direct connection between the brand and the collector. This meant that Zenith will aim to improve the customer experience. When buying a Zenith watch, the customer will need an experience more than walking into a shop, selecting the watch, paying for it, and walking out with the new watch. Each watch will come with more than just a warranty, but a guarantee of special privileges. For example, each watch will come with an invitation to visit the factory. Where the Zenith customer can exercise by presenting the invitation at the manufacture’s reception (the actual mechanics will, of course, require a pre-reservation, but details are being worked out), and be hosted on a factory tour and lunch with a senior executive. Brilliant move. In one fell swoop, Jean-Claude has immediately enhanced the customer experience with Zenith, but also provide an opportunity for himself or one of his senior executives to touch the customer and listen. Passionate, diligent, direct. The style of Jean-Claude Biver is infectious, and clearly a recipe for his great success. Photographed here in Tokyo, Japan, Sept 2017. Here is his arithmetic. If all 10,000 watches are bought by different people, and all of them came in one year, that would mean approximately 45 customers showing up daily at the manufacture (assuming 220 working days a year). Now we all know that as collectors, especially for a brand who gives us a good warm and fuzzy felling that this is not the norm, but rather each collector would probably own 4-10 from each of his favourite brand. So perhaps the 10,000 watches were bought by 7,000 people. And of those, say 30% decide to make the journey to Le Locle a year. That gives us only about 6 per day. Add some flow over from earlier year purchases, estimate the total to be about 10 to 12 a day. Definitely manageable by a small department, perhaps of only 1 full time person. Interesting concept. If Jean-Claude manages to pull this off, it will enhance brand equity among collectors a long way. Brilliant! So what does the future hold for Zenith? Jean-Claude grew a bit more pensive. “I think I should retire.” , he announced. “But maybe in 5 years.” We reflect with him, and entertain the idea for a moment. Nah, he won’t retire. Look at him, he is overflowing with energy. But in the reflection, we have seen that he has done it before, and thus capable. He has successfully handed the Hublot reins over the Ricardo. “I don’t do anything in Hublot theses days”, he said, “Ricardo does all the work, and yet I get all the applause”…he laughed his signature bark of a laugh. We were quietly thinking, if only for a moment, before he exploded with passion and excitement as we asked him about his secret. The Zenith El Primero Defy Lab on the wrist of Jean-Claude Biver. “Infinite passion. 90% of the CEOs of watch companies are 10X better than me”, he exclaimed, “but not many have passion which is nearly as equal.” Passion drives the tireless energy which comes from within. And second, he is a watch collector. Jean-Claude has an exemplary collection of watches from many other brands. This allows him to understand the psyche of the collector, and to deliver marketing strategies which meet their intellect. At Deployant, we identify with both of these characteristics. We are also driven by passion. The passion for watches, to communicate the beauty, the craftsmanship, the history, the value of horology. And we are collectors…our battle cry is “for collectors, by collectors”, and all our writers are collectors first, then writers next. But his real secret? Always doubt. Doubt is a double check. But don’t let doubt halt progress. Use it effectively as a tool to avoid failure. He gave the example of the development of the new oscillator in the Defy Lab. He had personally doubted that it would work. And thus challenged himself and the team to work harder. As a result, they overcame the initial problems and now geared for growth. Zenith not only showed a working prototype of the new oscillator, but a fully working, commercially available watch of which the entire collection of the first 10 were sold! With this confidence, Zenith has invested in the machine to make the oscillator. This is an expensive piece of gear capable of making 1 million pieces of the new oscillator a year. And by Baselworld 2018, Zenith would have invested in more machines, increasing capacity many fold. The strategy is to use these new oscillators for all Zenith watches, and even produce them for other watch companies. Listen to the nose (heart) and not to the head. As we were parting, both of us had other meetings to go to, I asked, “Off the record, Jean-Claude. What is your business outlook for Zenith, the LVMH Watch group and Luxury watches in general?”. He grabbed my arm at the elbow, shook it vigrously, let out his characteristic bark like laugh, “Peter! On the record! You can put this on the record!”.